Zoanthids are a choice beginner's coral. They are extremely hardy, durable, and can be incredibly colorful as well! Zoanthids live in oceans throughout the world. Though they are typically found on reefs or growing on rocks in areas with wave surge, they also inhabit the deep sea, reef flats, lagoons, and many other marine habitats. Most of the well-known zoanthids in the aquarium industry come from both the Atlantic and Pacific Oceans, and are from tropical and sub-tropical waters. But there are many other unique species living in all sorts of marine environments. These popular corals are readily recognized by the term Zoanthids or Zoas. But they are also known by all sorts of common names as well as many designer names created by their propagators. The most well known common names are Button Polyps, Sea Mats, Colonial Anemones, Stick Polyps, or just Polyps. Other common names include Zo's, Zoos, Zoas, Pallys, Zoanthid Button Polyps, Mat zoanthid, Colony Polyp Rock, Colony Polyps, Zoanthid Polyp Rock, Mat Anemones, False Coral, Colonial Anemones, Mat Coral, and Carpet Coral. Zoanthids is basically a catch-all term used for all cnidarians in the order Zoantharia. This order contains five families, one of which is Zoanthidae. The Zoanthidae family contains some of the best-known species in the aquarium trade, like members of the Zoanthus genus. The duplication found in these names may be why Zoanthid is the catch-all term for these wonderful animals, but it actually refers to any of the species from all five families of Zoantharia. The taxonomy of the Zoanthids itself has been very difficult. Although some species are described, it is still largely speculative. Difficult problems arise in identifying them. Partially this is due to the immense variety of colonies and polyps found in nature; and also because they are non-calcifying, the animals lack skeletal characteristics. Zoanthids have largely been identified to the genus level based on external characteristics along with internal anatomical differences. Internally they are described as being either brachycnemic or macrocenemic, which is the arrangement of their mesenteries. Mesenteries are sheets of tissue that divide the symmetrical body cavity of the polyp, with brachycnemic being incomplete and macrocenemic being complete. Beyond these identifying methods, studying DNA may need to be used for further division. As more is learned over time, we can expect to see more revisions, especially at the genera level! Zoanthid Taxonomy The taxonomy of the Zoanthids has had many difficulties. Although some species are described, it is still largely speculative. Difficult problems arise in identifying them. Partially this is due to the immense variety of colonies and polyps found in nature; and also because they are non-calcifying, the animals lack skeletal characteristics. Zoanthids are classified in the phylum Cnidaria under the class Anthozoa. The class Anthozoa itself has two subclasses, Octocorallia and Hexacorallia. Like their names suggest, Hexacorals are described as generally having six-branched tentacles, or a six-fold symmetry in their polyp structure. The Octocorals, which include Gorgonians, Soft Corals, and Leather Corals, are described as generally having an eight-fold symmetry or eight-branched tentacles in their polyp structure. The Zoanthids are placed in the Hexacorallia subclass, in the order Zoantharia. Other hexacorals include the orders Scleractinia, stony corals - both the small polyp stony corals (SPS) and the large polyp stony corals (LPS); Actiniaria and Ceriantharia, the sea anemones and tube-dwelling anemones respectively; Corallimorpharia, the mushroom anemones; and Antipatharia, the black corals. Under the Hexacoral subclass, Zoanthids are placed in the order Zoantharia, also called Zoanthidae or Zoanthiniaria. This order contains five families. The term Zoanthid is used for all species in the order Zoantharia. Zoanthids have soft bodies covered with a leathery skin, called the cuticle, which gives them protection. Many have a smooth, flat oral disc with tentacles around the outside perimeter, usually in two alternating rings. Each polyp has one mouth used for both food intake and to expel waste. Most produce a heavy, sticky mucus, which helps them to slough off the waste as well remove accumulated sediment and algae growths. The polyp sizes and shapes vary between Zoanthids depending on their natural environment. Zoas are typically found on reefs or growing on rocks in areas with wave surge. Those found where there is stronger water movement tend to have shorter polyps and tentacles, smaller oral discs, form dense encrusting mats, and produce less mucus. In deeper areas Where the water is calmer, they tend to have taller polyps and longer tentacles, larger oral discs, and produce more mucus. Zoanthids come in all sorts of colors from browns and grays to bright orange, red, yellow, green, blue and many color morphs. On some the oral disc can be a contrasting color from the tentacles. However the coloration seen on Zoanthids is usually not a product of their own pigments. Rather it comes from the marine algae, Zooxanthellae, that lives within their tissue. The relation between the Zoanthid and Zooxanthellae is more than the Zoas just getting pretty colors. These two organisms live in a symbiotic (mutualistic) relationship. The algae releases oxygen along with other metabolic products that are absorbed by the Zoanthid. In return, the Zoanthid produces compounds through the process of catabolism that provides products needed by the algae, primarily phosphorus and nitrogen. Zoanthids are non-calcifying so they don't contribute to reef building. Although they lack the distinctive stony skeleton found in the hard corals or stony corals, they do encrust hard surfaces. Zoas will encrust both living and dead substrates, but rarely sandy bottoms. In nature some species are even found growing on hermit crab shells. There are some species that live in conjunction with sponges or other invertebrates. At one time these Zoanthids were thought to be parasitic, but now it is believed that they actually work in a mutualistic relationship, each benefiting from the arrangement. The Zoanthid gains nutrition from the sponge, and the sponge in turn gains protection from predators as well as nutrients from the waste and mucus produced by the zoanthid. Types of Zoanthids The growth forms of the Zoanthids can vary from fluffy clusters, polyps in a stick formation, to colonial mats. They can be a single polyp or polyps connected by a runner, called a stolen, similar to some octocorals such as the Clavularia species. Or the polyps can be connected through a mat, called the coenenchyma. Some species incorporate bits of sand or sediment into the mat, making it more rigid to support the colony. The majority of species found in the aquarium trade tend to form large groups rather than solitary polyps. This family is most popular group of Zoanthids. it contains six genera including Acrozoanthus, Isaurus, Palythoa, Protopalythoa, Zoanthus, and Sphenopus. These genera are commonly found in the aquarium industry with the exception of Sphenopus. The Sphenopus genus is a solitary polyp, but it is not collected for aquaria. Known as a 'stick polyp', these zoas are commonly called Stick Anemones, Tree Anemones, and Tree Polyps. The Acrozoanthus affixes itself to either an abandoned tube worm casing, or to a parchment tube in which a Eunice tubifex worm still resides. In this symbiotic relationship, the Euncie tubifex worm is still alive and secreting material to keep the tube strong, thus making a more permanent home for the Acrozoanthus. Without the worm, the tube eventually disintegrates and the Acrozoanthus will have to move onto a new home. These generally show up in the aquarium trade as a few polyps on a tubeworm casing. They have small polyps with long tentacles, and are usually a gray, brown, or dark brown color. Called Stick Polyps, Tube Polyps, or King Polyps, they can be a single polyp or polyps connected with stolons. Their polyps have long tube-like bodies and very short tentacles. These long cylindrical bodies will have bumps on the sides and the end. At times they will face downward or sideways, and they like to bury part of their column in sediment. In the wild they grow at the tops of reefs or on sediment, and are often partially buried in sediment. These zoas first showed up in the aquarium trade as hitchhikers on rocks or other coral bases. But they have slowly become more and more popular, and are now sometimes available to purchase. Their colors are generally gray, brown, or green. Called Moon Polyps, Encrusting Anemones, Sea Mats, Zoanthid Button Polyps, and Button Polyps; these zoas are very common in the aquarium trade. They are colonial anemones. In nature Palythoa are usually found on reef flats or lagoons, so will have small bits of sand or sediment incorporated in the coenenchyme, or mat. Their polyps are short and partially embedded in the mat. They also can completely retract into this thick mat, leaving behind what appears to be a rubbery encrusting surface with holes all over. The polyps have broad, flat oral discs and their tentacles can be short or long and thin, knobby or tapered. Their colors can be cream, white, brown, or yellow, as well as other shades. They are similar to the Protopalythoa genus, but the polyps of the Palythoa genus are smaller and they generally have fewer tentacles surrounding the rim of the oral disc as well. The Protopalythoa species are said to have the largest polyps of all the zoanthids! They are commonly known as Sea Mats, Zoanthid Button Polyps, False Anemones, Zoas, Zoanthid, and Button Polyps. Some common species include the Giant Sun Polyp P. grandis, Green Button Polyp P. mutuki, and the Trumpet Polyp P. variabilis. This genus was once part of the Palythoa genus. Whether these are Protopalythoa genus or the Palythoa genus is in a state of confusion. At one point these were members of the Palythoa genus, but then they were distinguished by their growth form and placed in the Protopalythoa genus.However, some experts again consider this genus to be part of the Palythoa genus. Which genus the scientific community as a whole ultimately settles on is yet to be seen. Zoanthus have rather small oral discs, rarely less than 1/2" (1.25 cm) in diameter. They are quite common, occurring in a variety of reef environments, and are fast growing. They primarily grow as mats, but do not incorporate sand or sediment in the coenenchyme. They come in all sorts of colors from browns and grays to bright orange, red, yellow, green, blue and many color morphs. On some, the oral disc can be a contrasting color from the tentacles. These popular zoas are known by all sorts of names including Zoanthids, Button Polyps, Sea Mat, Zo's, Zoos, Zoas, Pallys, Zoanthid Button Polyps, Mat zoanthid, Colony Polyp Rock, Colony Polyps, Zoanthid Polyp Rock, Mat Anemones, False Coral, Colonial Anemones, Mat Coral, Carpet Coral, or just Polyps. This family has three genera including Gerardia, Isozanthus, and Parazoanthus. Only Parazoanthus species are common in the aquarium industry. These zoas are the popular Colonial Yellow Polyps, Yellow polyps, or Golden Polyp Rock. Other names they are known by are Sponge Zoanthid, Yellow Encrusting Anemone, Zoanthid anemone, Parazoanthid, and Encrusting Polyp. Parazoanthus are generally found growing on living organisms such as gorgonians, hydroids and sponges. If present, their mat is membranous, without the debris or sand found in other zoanthid mats. The polyps contrast in color to their host. They release toxins to ward off any predators which helps the host. The sponges do need moderate to strong water flow to stay healthy, thus keeping the polyps alive. This family has only two genera, Epizoanthus and Thoracactis. They are both uncommon in the aquarium industry, but on occasion an Epizoanthus species may show up. These are known as the Gray Encrusting Anemone and Brown Encrusting Anemone. Unlike other Zoanthids, some species (possible all) do not receive their nutrition from the symbiotic marine algae, Zooxanthellae. They will need daily feedings of liquid or finely crushed marine foods, plankton, and newly hatched Artemia. A feeding tube works best. Only reproduction of daughter polyps is proof of their well being. 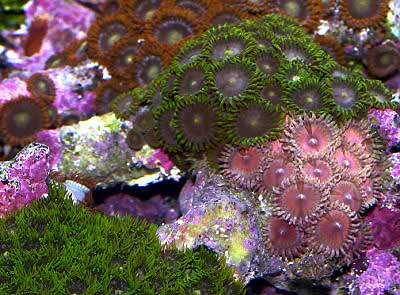 How to Keep Zoanthids Zoanthids are some of the hardiest and most durable inhabitants for the reef aquarium. They are easy to keep, so make a wonderful beginner's coral. However Zoas, like other colonial and sessile encrusting invertebrates, will compete for space. They don't have a very strong sting, so are at a disadvantage there, but they are fast growers, so can often overtake their neighbors. In a well established aquarium, they can be kept with a number of invertebrates including stony corals and leather corals. Vibrio can at times be in the coral mucus, thus causing a Vibrio infection in humans if care is not taken. Most people have no problem, but caution and common sense play a role here. Wearing gloves and possibly goggles may be the safe route to go. Also, if handling a Zoanthid, make sure the mucus is not on your glove or hand before handling any other corals! Zoanthid Care Here are some basics for keeping Zoanthids in the home aquarium, but be sure to see the individual species for information specific to the type of Zoanthid you are keeping. A well-feed live rock/reef environment is what is needed for the majority of Zoanthids. Provide hard surfaces for them to encrust such as live rock, rock, dead corals, or pieces of porous ceramic. Many zoa species live symbiotically with the marine algae Zooxanthellae, so will need adequate light. Zoanthids can fare well under most lighting conditions, even Metal Halides will not adversely affect most species. Because they capture food from the water, a good water flow is important. This will also help reduce the amount of sediment and debris on the surface of their polyps. Feeding Zoanthids Zoanthids have developed several feeding strategies, though these vary somewhat depending on the species. Through a symbiotic relationship with a marine algae, known as zooxanthellae, many zoas receive a large part of their nutrients. They also capture planktonic organisms and food particles from the water column, and many can absorb dissolved organic matter. Although these feeding methods serve them well in nature, in the aquarium all species need to be fed regularly to thrive. They can be offered a variety of meaty foods, such as minced pieces of fish, brine shrimp, mysis, cyclopeeze, and krill. Depending on the species, either plankton or microplankton can also be provided. They are quite opportunistic, and will usually extend their polyps to capture food both day and night.